Actor Lee Min-ho wrapped up his global tour “RE:MINHO” with a last concert at KINTEX in Goyang, northwest of Seoul, on Saturday. 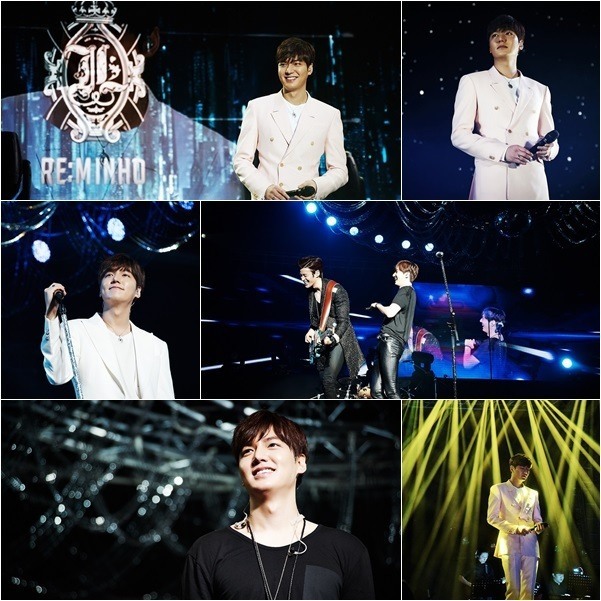 The tour’s title “RE:MINHO” refers to a new start, intended to show Lee’s various new charms, according to his agency. Lee’s global concerts were held in seven Asian cities in China, Japan, Thailand and Korea, attracting about 50,000 fans in total. The last concert at KINTEX was broadcast live in about 140 countries around the world on YouTube and Chinese website Sohu, proving the star’s worldwide popularity. “I am happy to be here with you from the beginning of the year,” the actor greeted his fans. “I wanted to do what I can, for my fans unchanging love. Every time I stand on the stage, I felt that my fans were like my family,” he explained on the intention of this global tour. Lee began the concert with “Love Hurts” and performed 12 songs in total. He closed the concert with “Say, Yes.” The actor also showed improvised cute dance moves to meet the fans’ high demands. The actor’s debut film “Gangnam 1970” will be released on Jan. 21. Starring Lee and actor Kim Rae-won, the upcoming noir film portrays the two men’s friendship, betrayal and lust for money and power around the Gangnam district in the 1970s, during the region’s real estate investment boom.